The Final Battle! is a rare minigame in Mario Party 4 and Mario Party: The Top 100. Once a player becomes the superstar of every board in the story mode of Mario Party 4, Bowser will steal all of the presents. 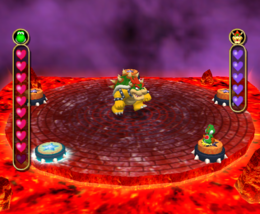 The player then enters the Final Battle Cube, Bowser's version of the Party Cube. The objective of the cube is to chase Bowser and retrieve the player's stolen presents. The player starts with ten hearts, which serve as a Health Meter. Every time the player gets hit, one heart is removed. If all hearts are lost, the player loses the minigame. The first and third sides of the cube involve hopping on platforms, some of which have fire jets. 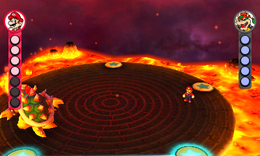 The player has to be careful not to fall into the magma; any character who touches the lava will instantly lose. The first side has a path of four platforms, while the third side has two paths with six platforms overall. If they can complete it within sixty seconds, then the player will move on. The second and fourth sides involve solving a puzzle similar to the one found in Lethal Lava Land in Super Mario 64. In the first has three pieces of 2x2 puzzle, which the player must Ground Pound to move. Two Koopa Kids try to hinder the player's progress by dropping flaming cannonballs and mini-tornadoes. The second has eight pieces of a 3x3 puzzle, and Bowser himself will appear wielding a fiery boomerang. The fifth side involves a battle with Bowser. Five buttons are located around the perimeter of the area. By Ground Pounding three, an ephemeral triangle appears, lightning striking anything in it a few seconds later. The goal is to surround Bowser with the triangle, lead him into it, and cause him to get shocked. Bowser can retaliate with his boomerang and flame breath. Later on, he will move while shooting flames and charge at the player. It takes five shocks to defeat Bowser. The player can be damaged by the lightning shock as well. Once defeated, Bowser will return the player's presents, and give them another present depicted in Bowser's likeness. In Mario Party: The Top 100, The Final Battle! is an unlockable special minigame, with Bowser Jr. replacing the Koopa Kids and the player starting out with seven hit points instead of ten. During the Bowser battle, the camera rotates to follow the player, rather than staying fixed. Also, there is no time limit in the first and third sides. The minigame announcer will call out "Finish!" after defeating Bowser instead of clearing every side. Lastly, falling into the lava will now only take away one hit point (or none during post-hit invincibility) rather than making the player lose instantly. Description – "Overcome the obstacles to defeat Bowser!" On-screen (Bowser Jr. and Bowser Platform) – "Jump from platform to platform to chase Bowser Jr./Bowser!" On-screen (Bowser Jr. and Bowser Puzzle) – "Ground Pound the tiles to solve the puzzle!" On-screen (Bowser Battle) – "Ground Pound 3 switches to defeat Bowser!" The first side of the cube. The second side of the cube. The fourth side of the cube. Saigo no Tatakai!! The Final Fight!! French Combat Final! Final Battle! German Das letzte Gefecht! The last fight! Italian La sfida finale! The final challenge! This page was last edited on March 9, 2019, at 16:25.